Last Sunday, the Florida Gators’ women’s basketball team beat Texas Tech 72-67 for their first win of the season. On Wednesday, they made it back-to-back victories after winning 64-53 over Bethune-Cookman. 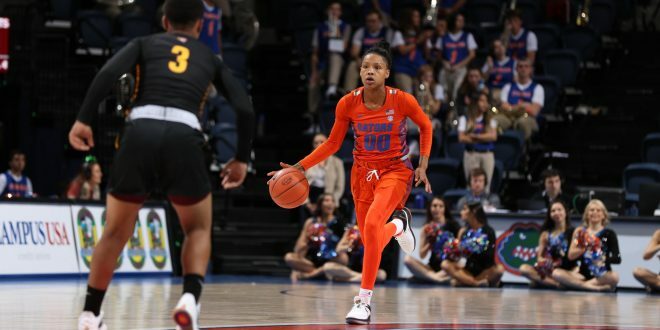 The Gators’ game against the Wildcats had headlines before tip-off as Funda Nakkasoglu was wearing a boot around her right ankle due to a sprain. When talking about the game itself, Florida coach Cameron Newbauer was impressed with how his team performed on both ends of the floor. The biggest story of Wednesday night was the absence of Funda Nakkasoglu, Florida’s leading scorer who is averaging 20.1 points per game. Without her, Florida initially had a hard time putting the ball in the basket. The Gators shot just 25 percent from the field and 22.2 percent from behind the arc in the first half. Delicia Washington, who came into the game averaging 15.4 points a contest, was 2 of 10 overall. Florida’s 22 points at halftime was their lowest first-half point total of the season. While Florida may not have been stellar shooting the ball, they were effective in other key areas. 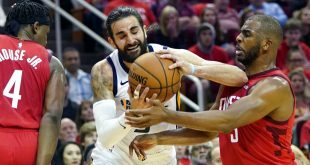 As a team, they gobbled up 10 offensive rebounds and had 27 boards in the first two quarters. Ariel Johnson was a pleasant surprise as the freshman guard had seven rebounds of her own. On top of out-rebounding Bethune-Cookman 27-21, Florida had a variety of players score the basketball. The Gators had six players register points on the stat sheet. Zada Williams had five points and five rebounds, and Kristina Moore contributed four points. Coming into the game, stopping the Wildcats’ Angel Golden was a top priority for the Gators. Golden, who was averaging 20 points a game prior to Wednesday, was held to just three points in the first 20 minutes of play. The third quarter featured a back-and-forth battle between Golden and Washington. Golden caught fire and demonstrated her shot-making ability, scoring 9 of her 14 total points in the period. Washington had eight points during this stretch, which led to Florida extending their lead to 10 points going into the fourth quarter. The junior guard credited Nakkasoglu and Danielle Rainey for her performance at this crucial time in the game. It could have a closer contest down the stretch, but the Gators showed great resiliency. Although the Wildcats put up 20 points in the final frame of play, Florida went toe-to-toe with them offensively. Freshman Kristina Moore was extremely poised from the line, knocking down all five of her free throw attempts. Williams scored six of her 15 points in the fourth quarter and continued to excel under the basket. Ariel Johnson reached double-digits in this stretch to mark her second consecutive game of scoring at least 10 points. Their defense may have relaxed a little in the final ten minutes, but the Gators still outscored the Wildcats 21-20 in the final quarter of the game. One of the main takeaways from Wednesday’s performance was that the team could win without Nakkasoglu. Reflecting on Nakkasoglu not being able to play, Newbauer saw it as a chance for other players to make up for her production. With the tone being set in the first half, Florida finished the game strong on the glass. The Gators out-rebounded the Wildcats 48-38 and hauled in 17 offensive rebounds. Redshirt junior Zada Williams talked about what led to the team’s excellent performance in this area. Up next, Florida will take on Florida A&M in the final game of their four-game homestand. The Gators (2-6) will take on the Rattlers (1-5) at 2 p.m. on Sunday. Nakkasoglu is questionable for this match up as well.